After a VERY short break Victoria will be impacted by another upperlow from Tuesday, moving fairly quickly accross the state and clearing mostly by late Wednesday, with the possibility of more widespread rain. Here is a look at GFS from the latest run. Won't be as cold as this week with Temps in the mid-high teens in the south and 20's in the North. EC and GFS have pulled the heavy rain northward on todays 00z run. ACCESS G this morn. concurs, the high way down south of Tassie may be one of the factors with the low that bears so much promise, but at this stage could be exiting mainland Aus up Sydney way. Large cut of low like situation with this event over central eastern Aus. NSW could do very nicely out of this, maybe coastal flooding, and any rain at all in Vic will be good follow up to recent falls. Yeah might be interesting for those in the far north west but most now look lucky to get a shower. Hmmm EC seems to have gone further north. 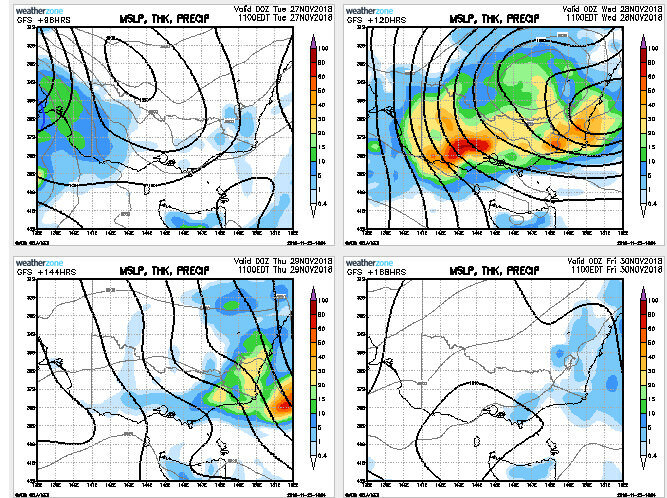 Interesting that Ukmet is a bit further south so giving a reasonable follow up from ranges north and out east later. CMC also further south. All models have pretty solid rain atm in NW VIC and adjacent parts of SA. Tonights run will be interesting, hard to imagine a low crossing NSW coast wouldn't be pulled south a bit once crossing and give at least the far east a bit of a drink. Regarding low pressure centre more north this time, for Gippsland this is actually a positive. My own Nth Gippsland records show that flooding easterly rain events typically involve a baro reading nearer to 1016 hPa. .....but unfortunately this system looks to be steadily moving towards the Tasman - so at this stage useful, but non-flooding rains for Nth Central and East Gippsland. I reckon the Latrobe might run a banker at Rosedale by the end of next week - plenty of wet around the Warragul/Nojee/Mt Baw Baw region from this (still lingering) past event. Wow P, big call and I will doff the hat to you on this one! The big low way down south is the impediment ? ps - hope you are right btw. Looks like there is pretty much model agreement this is going to be more of a significant event for NSW now. Look at that Access-G 100m+ Bulls eye over Sydney! Yep, other than storms in the North West really not looking like much for us down here in Southern Victoria. Instead looks like a mostly dry mild week hopefully with some sunshine which would be nice. ACCESS R, Sale area lucky to see 5mm Wed on my amateur interpretation - YMMV. Total in gauge, Sale town - 35mm - (last week and over weekend) -very nice. Thunder reported from home. No rain yet. Hazy sun here in the city. In between two storms in South and North but very slow moving, humidity is very good does drop some rain from small clouds. 3mm up here in Nagambie so far, hopefully a little bit more of the next couple hours.